There is a mini-weekend challenge going on now at Paper Patch Crafts. 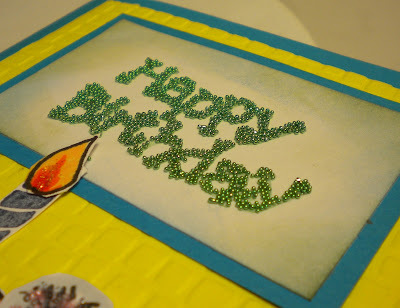 The theme is a fun, bright and cheerful birthday card that contained either one balloon, cupcake, hat, or piece of cake. I dug through some old stamps I had and disovered the fun cupcake set I bought many years ago from Stampin'Up. I outlined the stamped images with my Copic Multiliner to make the image pop a little bit more. The kitty stamp is even older and I can't recall the company I bought it from. I like the sprinkles on the cupcake. Looks good, I'm sure he'll love it. 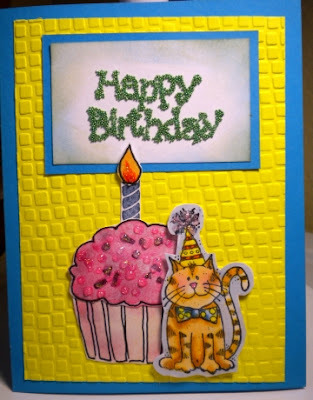 I love how you did this card, so colorful and cheerful, and the text is so awesome. TFS.